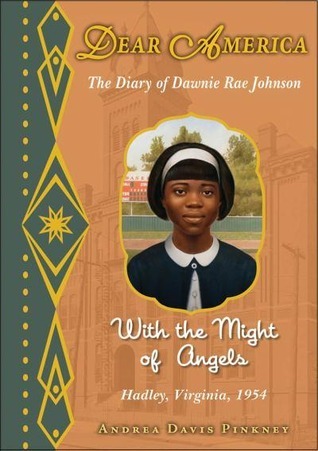 With the Might of Angels: The Diary of Dawnie Rae Johnson, Hadley, Virginia, 1954 by Andrea Davis Pinkney. Scholastic, 2011. Currently Available. Face Value: As Brianna pointed out, these recent reissues of the series still capture a lot of what made the 90s versions of the books feel so special. I don’t like them quite as much, but honestly that’s mostly just my own nostalgia talking. And this really is a pretty cover. Dawnie looks just right, sincere and determined and the buildings in the background capture the world of the story quite well. Also – they now put the author’s name on the book cover, which the earlier incarnations did not. I still sort of love the magic of it feeling like a real diary of a real person, but also they have some big names writing these books, and I’m glad to know who they are upfront. Does it Break the Slate? Definitely. Like most Dear America heroines, Dawnie Rae Johnson is insightful and engaging. Dawnie is also incredibly brave. She takes a huge risk and faces challenges as a 12 year old that most of us as adults wouldn’t be able to handle. She stands up for herself, her family and believes in her own right to a good education. And Andrea Davis Pinkney also does a great job of writing her as a completely believable kid. I am nothing but inspired by this character, and think others will feel the same. Who would we give it to? We need more books about this topic. There are some really good nonfiction ones (I read Melba Patillo Beals memoir in 8th grade and remember details from it like I read it last week) and Sharon Draper’s Fire from the Rock is a good fictional account. But I think it’s essential for kids to know about integration, how horrific it was for the kids and families who made it happen and how big of an issue this was not very long ago. Review: It’s 1954 and Dawnie Rae Johnson’s life is good. She just received a new diary for her birthday (as happens in I am guessing 90% of Dear America books) and is writing about her life. She loves her family and her friends and her pogo stick and she’s at the top of her class in school. But her school leaves something to be desired. As she explains, “I mean, I like going to school, but I hate the stuff in school. At Bethune, everything’s broke.” Compared to Prettyman Coburn, the all-white school two miles away, Dawnie knows her school doesn’t measure up. And then comes the Brown v. Board of Education decision. And Dawnie finds herself the only black student at Prettyman Coburn. It’s not easy – people are furious that the school is being integrated and Dawnie is treated terribly by other students, teachers and community members. Her father loses his job. The one teacher who stands up for her is fired. Throughout the story, Davis Pinkney doesn’t shy away from how bad things could get for kids in Dawnie’s situation, or give us answers that are too easy. She is ignored, assaulted and insulted constantly by both students and teachers. The atrocities she describes are both cruel and based in the reality of what students like Dawnie faced. Sometimes historical fiction for younger grades is accused of softening historical facts and while this story gives us a positive role model and a happy ending, it never compromises how bad things got. Young readers will not only appreciate this acknowledgement of their capacity for understanding, they need to know about this moment in not-too-distant history. But to get us through these terrible things, Davis Pinkney has written the Johnson family, an amazingly supportive wonderful family that has Dawnie’s back throughout everything. I love reading books with great parent characters, and the strength, love and anger we see from the Johnsons is palpable. There’s never any question that Dawnie deserves the best possible opportunities and that they as a family will do whatever they have to do to help her get them. And her younger brother Goober (who is on the Autism spectrum) is a wonderful character in his own right. The relationship between brother and sister is a lovely component to this book. Dawnie herself though, is the best part of this book. She is incredibly brave, tough and determined. She’s also funny and kind – a good sister and friend. She takes on the “panic monster” that hides inside of her and faces integration, racism and her own fears head on. Reading about her journey is satisfying and meaningful and demonstrates the best of what the Dear America series has to offer. This entry was posted in Middle Grade, Reviews, Theme Week and tagged 1950s, Brown v. Board of Education, Dear America, Diversity, Education, Family, Historical Fiction, Integration, Racism. Bookmark the permalink. I don’t think I read this one back then, but it sounds like a good read. I should pick up some of the reissues for my cousins.